Unlike other investigation modalities, laparoscopy has been very useful in characterizing NPT thus enabling some standardization of treatment modalities. Several classification of NPT based on laparoscopic findings have been proposed. Essentially, these are based on the testicular location or its absence, relationship of the testes, vas, and vessels to the internal ring and length of the testicular vessels. Decisions are made on the type of intervention at the same sitting based on this characterization. This ability to diagnose, characterize, and treat at the same sitting has been what made laparoscopy the gold standard in managing NPT. The management of NPT in Nigeria has long been largely by open surgery. 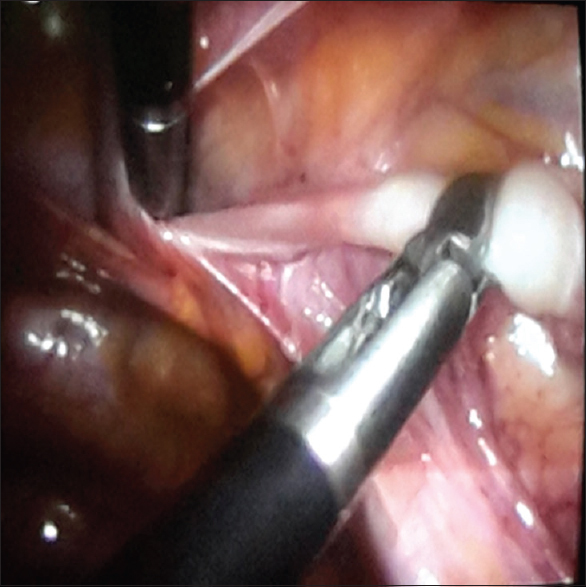 The only scanty reports on laparoscopic orchiopexy have been documented as part of a general review of experiences with laparoscopy. However, few centers have documented their experience in laparoscopic management of undescended testes. In this report, we analyze and document the characteristics and outcome of nonpalpable testes that we managed laparoscopically in our center. Data on age, clinical features, intraoperative findings, and outcome were collected from consecutive patients with NPT treated over a period of 2 years (June 2014–July 2016), using a structured data sheet. All the patients underwent initial diagnostic laparoscopy. With the patient on the general anesthesia and tracheal intubation, a 10 mm umbilical port was inserted and pneumoperitoneum achieved using carbon (IV) oxide at pressure of 10–14 mmHg. Two other 5 mm lateral ports were placed at the iliac fossae in such a manner to enable good hand movement. The internal ring is noted whether it is closed or open, the state of the vas and spermatic vessels were noted, and the testes searched for from the pelvis to the lower pole of the kidneys. If the testis is present, its size, distance from the internal ring and mobility were recorded. If the testis was absent; whether the vas and vessels entered the canal, ended blindly or were absent were noted [Figure 1]. The surgery that was done depended on the findings during diagnostic laparoscopy. If the vas and vessels have exited through the internal ring or the testis is peeping, standard orchiopexy was done. One-stage laparoscopic orchiopexy was done for low intra-abdominal testes if intraoperatively the testis can be dragged to reach the contralateral ring; while two stage orchiopexy was done for high abdominal testis or those that cannot reach the contralateral ring. No other intervention was done if the vas and vessels ended blindly or were absent. Testicular nubbin or grossly dysmorphic testes were removed laparoscopically. Patients were followed up for after surgery for a period ranging from 3 to 18 months. A total of 15 patients with 23 testes were treated. Their age ranged from 1.1 to 29 years with a median of 5 years. Eight patients had bilateral NPT. Of the remaining unilateral cases, three occurred on the right side and four on the left. The locations of the testes are as shown in [Table 1]. The internal ring was open in 11 of the cases [Table 2]. Of the 15 testes that were fixed either laparoscopically or by standard orchiopexy, 11 were still in the scrotum and with a testicular volume not less than preoperative value after the follow-up period. Of the unsuccessful ones, four has reduced volume and one was located high in the scrotum. There was no intraoperative event necessitating conversion to open surgery. All the patients were discharged within 24 hours of operation and were seen in the outpatient after 1 week to assess the port sites and at 1, 3, and 6 months (if no other untoward event) to assess for testicular volume. Four patients had port site infection (stitch abscess) which easily healed with treatment. In Nigeria and many other sub-Saharan African countries, management of NPT has been quite challenging and is often by open surgical technique., The resultant outcome of this is the low number of managed cases, high risk of surgical complications, risk of classifying an abdominal testis as absent testis hence increasing the risk of late detection of testicular cancer and the attendant morbidity associated with retroperitoneal or intraperitoneal approach. Laparoscopy has been adjudged as the option of choice for the management of NPT. In our study, laparoscopy has enabled us to clearly define and characterize the state of the testes in all cases. In six testes, it clearly aided the diagnosis of absent testis for which no other intervention was necessary, a situation which may have necessitated an open abdominal or extended inguinal operation [Table 3]. In the two cases that had standard orchiopexy, laparoscopy was also quite useful as it defined the position of the testis which was clinically nonpalpable and also enabled the assessment of the vessels and the extent to which the testes can be mobilized down. Laparoscopically, abdominal testis can be mobilized to gain adequate length. Perhaps the greatest value of laparoscopy is in managing a high abdominal testis. Five of our patients with high abdominal testes and short vessels had staged Fowler-Stephens procedure. The testicular arteries were ligated and the testis mobilized and fixed after 6 months. This enabled us to avoid an initial inguinal search which would have damaged the collateral arterial supply to the testes and worsen the outcome of a staged orchiopexy. Again, in two patients, the morphology of the testes was assessed and orchiectomy done (prior consent were obtained after parents or caregivers were called into the theater, and the findings reviewed again with them). Some authors have suggested an initial inguinal approach in the management of NPT noting the cost implication of laparoscopy and the fact that some undescended testes may have entered the canal, for which standard orchiopexy is sufficient. For this category of patients, careful clinical examination repeated before surgery under general anesthesia may help exclude them from laparoscopy. When clinical diagnosis is not certain even after this, diagnostic laparoscopy is still apt. But for the rest, undoubtedly laparoscopy has been adjudged very useful and safer and with lesser morbidities. The majority of the patients, (11 out of 15) presented to us late. After 2 years of age, an intra-abdominal testis is thought to significantly lose its spermatogenic function and sometimes undergo atrophy. In our series, though we did not assess spermatogenic function, only one testis of these late presenters was atrophic, three has low volume, and the rest were of normal morphology. The only case with gross dysmorphology is a syndromic child with contralateral absent testis, micropenis, obesity, hydrocephalus, talipes equinovarus, and hearing impairment. Late presentation was also observed by many authors from the Nigeria.,, The attributed reasons for late presentation include ignorance, late discovery by parents or incidental medical findings, and financial constraints. Mobilization of testis in these older patients with high intra-abdominal testes was challenging due to short testicular arteries. In two cases where staged Fowler-Stephens was not successful in bringing down the testes completely, open surgical approach (inguinal exploration with retroperitoneal dissection) was done after another 6 months to complete the orchiopexy. The failure to completely mobilize the testis during the second stage Fowler-Stephens may be ascribed to a developing learning curve as these were done in the early period of the study. The outcome favorably compared with results from other emerging countries. Most of the unsuccessful outcomes involved the high abdominal testis with very short pedicle. The overall morbidity rate is low. Patients were all discharged within 24 hours and were quite active early. The parents apparently were also satisfied with the cosmetic appearance. Initiating and maintaining a laparoscopic surgery in our side of the world is quite tasking and challenging. Militating issues include high cost of equipment and usables, dearth of trained support staff, poor maintenance of equipment, and the mindset among many that it is not possible. Reassuringly, these are melting away as more young surgeons and centers are getting involved as evidenced by the emerging publications trickling in. In a developing country like ours, laparoscopic management of NPT has both diagnostic and therapeutic advantage and is quite useful, safe, and with minimal morbidities. The outcome is good and comparable with other centers. Perez-Brayfield M, Kirsch AJ, Baseman AG. Pediatric Cryptorchidism Surgery. Medscape. Available from: http://www.emedicine.medscape.com/article/1017420-overview#a4. [Last accessed on 2016 Oct 21; Last updated on 2015 Jul 27]. Tennenbaum SY, Lerner SE, McAleer IM, Packer MG, Scherz HC, Kaplan GW. Preoperative laparoscopic localization of the nonpalpable testis: A critical analysis of a 10-year experience. J Urol 1994;151:732-4. Abbas TO, Hayati A, Ismail A, Ali M. Laparoscopic management of intra-abdominal testis: 5-year single-centre experience – A retrospective descriptive study. Minim Invasive Surg 2012;2012:878509. Baillie CT, Fearns G, Kitteringham L, Turnock RR. Management of the impalpable testis: The role of laparoscopy. Arch Dis Child 1998;79:419-22. AbouZeid AA, Safoury HS, Hay SA. Laparoscopic classification of the impalpable testis: An update. Ann Pediatr Surg 2012;8:116-22. Ray-Offor E, Okoro P, Gbobo I, Allison A. Pilot study on laparoscopic surgery in port-harcourt, Nigeria. Niger J Surg 2014;20:23-5. Abdur-Rahman LO, Nasir AA, Adeniran JO. Paediatric laparoscopic surgery in Ilorin: The needs and the advantages. Trop J Laparosc Endosc 2010;1:45. Adesanya OA, Ademuyiwa AO, Elebute OA, Ojewola R, Bode CO. The undescended testes in children: A prospective epidemiological study. East Cent Afr J Surg 2013;18:45-8. Elder JS. Laparoscopy and Fowler-Stephens orchiopexy in the management of the impalpable testis. Urol Clin North Am 1989;16:399-411. Chandrasekharam VV. Laparoscopy vs. inguinal exploration for nonpalpable undescended testis. Indian J Pediatr 2005;72:1021-3. Denes FT, Saito FJ, Silva FA, Giron AM, Machado M, Srougi M. Laparoscopic diagnosis and treatment of nonpalpable testis. Int Braz J Urol 2008;34:329-34. David OO, Iyekoretin E. Undescended testes in a developing country: A study of the management of 71 patients. Afr J Paediatr Surg 2008;5:11-4.